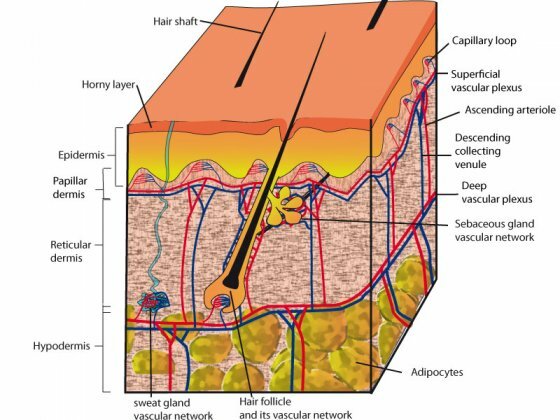 In the skin, only the dermis and hypodermis are vascularized, the epidermis being a non-vascular tissue. The skin is richly supplied with a vascular network, largely exceeding its nutritive requirements, being also involved in thermoregulation , wound healing, immune reactions and the control of blood pressure. Cutaneous vessels belong to the arterial, venous or the lymphatic system; they are small branches from underlying vessels of the muscles that penetrate the subcutaneous fat, enter the deep reticular dermis and ascend vertically to the epidermis. The ascending arterioles join with one another by vascular arcades to form two distinct horizontal plexuses. The deepest plexus lies close to the dermal-hypodermal junction and provides nutritional arteries to sweat glands and hair follicles. At the junction between the papillary and reticular dermis, the ascending arterioles ramify into a more superficial subpapillary plexus. Vessels from this plexus then further divide into a vascular loop ascending vertically toward the surface except in the nail bed. 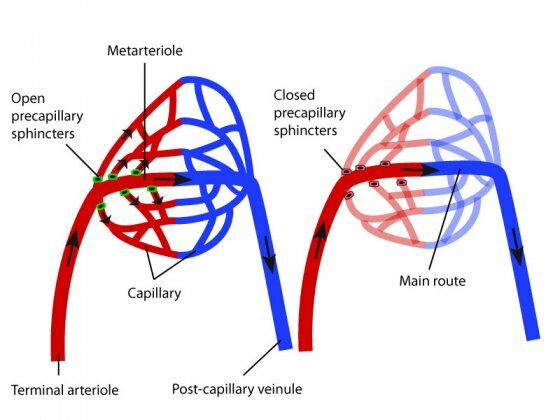 Vascular loops are made of yet smaller terminal arterioles which constitute the arterial part of the capillary loop, of arterial and venous capillaries forming a hairpin turn, and of descending post-capillary veinules which then empty into larger venules of the venular plexus. Schematic view of the cutaneous microcirculation structure. Direct specialised arterio-veinous shunts, between arterial and venous circulation are present in some areas (palm, soles, fingers, nail bed, nose, ears) They are composed of an ascending arteriole called glomus body, modified by 3 to 6 layers of muscle cells and venules. These structures function like sphincters, allowing the capillary circulation to be short-circuited when they are open. The glomus can also be completely closed when blood pressure is below a critical level. On left, when the sphincters are open, the blood goes through all the capillaries while on right, when the sphincters are closed, the blood flows only through the metarteriole. Dermal arteries and arterioles (< 0.3 mm) have a round lumen, and their wall is made of three layers: the intima, the media and the adventitia. The intima is made of endothelial cells resting on an undulating internal elastic lamina. ; the media consists of two layers of smooth muscle cells, lying longitudinally or concentrically, of increasing thickness in deep vessels; the adventitia is mainly composed of connective tissue, with occasionally an outer elastic lamina. Veins and veinules have a similar structure than arteries and arterioles, but they have larger lumen and a thinner muscular wall occasionally containing valves; the internal elastic lamina of the intima is very thin or absent; the adventitia is thick, poor in elastic fibres. Arterioles and veinules of the deep dermis and hypodermis are larger than the corresponding vessels of the superficial plexus (diameter 50-100 versus 25 mm, wall thickness 10-15 versus 4-5 mm), and pericytes are more abundant. Ultrastructural view of a transverse section of a capillary in the dermis of human skin. Ultrastructurally, endothelial cells contain well-developed bundles of vimentin-type intermediate filaments and actin filaments in the larger arterioles of the mid- and deep dermis. They are characterized by specific organelles, the Weibel-Palade bodies, which are electron-dense, cigar-shaped bodies measuring 0.1-0.3 mm , with 15 nm-thick tubules lying parallel to the long axis of the organelle; they are the storage site of the coagulation factor of von Willebrand (“factor VIII”). Weibel-Palade bodies are absent in lymphatic endothelial cells (except in those of larger vessels). Capillary endothelial cells possess fenestrations allowing the passage of intravascular fluid. 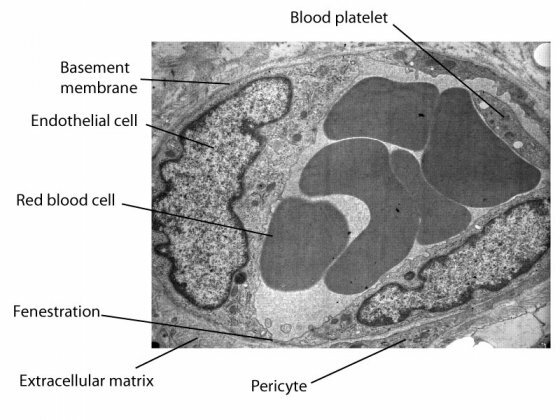 Pericytes have dendritic processes and are surrounded by a basement membrane; they contain cytoplasmic myofilaments (5 nm), also found in glomus cells. The lymphatic system plays an important role in regulating pressure of the interstitial fluid, in clearing the tissue of cells, proteins, fluids and degraded substances, and in immune reactions. It begins with blind lymphatic capillaries (or prelymphatic tubules) in the papillary dermis that drain into larger vessels forming a superficial plexus in the sub-papillary dermis, and a deep plexus, below the deep arterial plexus. The lymphatic network is particularly well-developed in digital, palmoplantar and scrotal skin. Lymphatic vessels are hardly visible in normal skin, being more readily apparent when they are dilated under the effect of an increased interstitial pressure (oedema). They can be distinguished from other cutaneous vessels by their larger luminal diameter and thinner wall made of a continuous layer of flat endothelial cells, having a scant cytoplasm and a prominent nucleus. Endothelial cells are attached to adjacent molecules of collagen/elastin by anchoring filaments that stretch under the effect of the increase of tissue pressure, thus favouring the removal of excess interstitial fluid. Except from the most superficial vessels, lymphatics contain multiple valves with intrinsic motility; they are devoid of basal lamina and of pericytes. Lymphatics of the deep dermis (namely of the lower limbs) occasionally have a muscular wall, but have no elastic lamina. Ultrastructurally, intercellular junctions are less conspicuous than in blood capillaries. en STRUCTURE AND FUNCTIONS Normal human skin structure Skin vasculature ?